National Filet Mignon Day was this past week so I decided to try out Adam Perry Lang’s High-Low method on my Grill Dome. Certified Angus Beef filet from Food City here in Knoxville. Adam is a renowned pitmaster, a classically trained chef, restauranteur, and appears regularly on Jimmy Kimmel Live! Adam has "dabbled" in competition BBQ, winning first place pork shoulder at The American Royal (one of the BBQ “majors”). He is also an accomplished grilling cookbook author. His Serious Barbecue book is a modern classic and I think that BBQ25 is a must have for up and coming grillers. 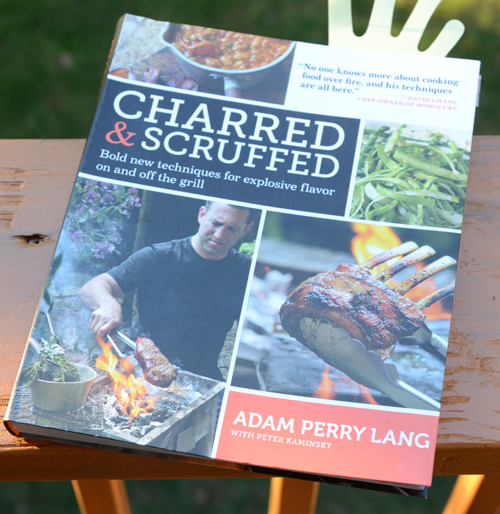 Adam’s High-Low technique comes from his third book, Charred and Scruffed, and it is similar to the wildly popular “reverse sear” technique. But instead of doing a low temp and then a high temp, the High-Low technique relies on positioning in the grill. This method starts off cooking “high” up in the grill on a raised rack to moderate the heat intensity. 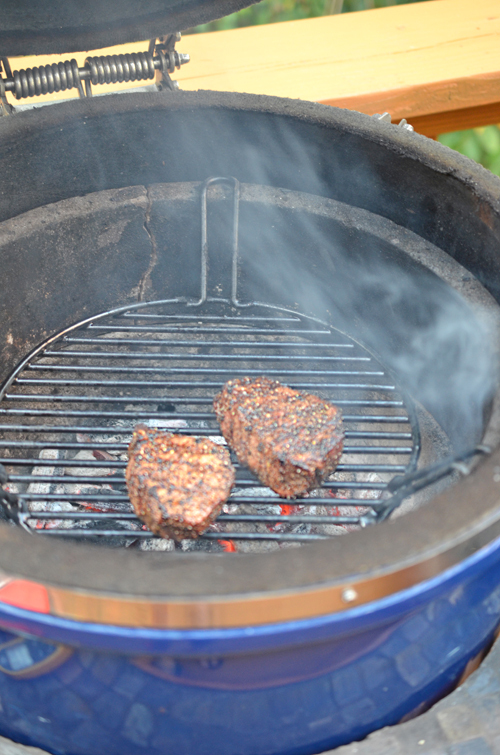 Then it finishes close to the red coals, searing it off. This technique works extremely well in a kamado grill. I followed his technique and baste recipe but used my normal rub and I made a Marsala-Portobello sauce to compliment the filet. 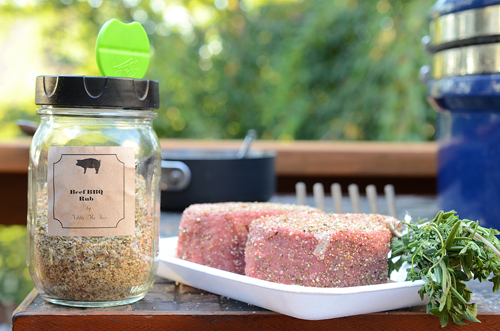 For the beef rub, you can use Adam's Four Seasons Blend or another beef rub, I used my NMT Beef Rub. To make the herb brush, an APL signature technique, take a handful of fresh herb sprigs and tightly tie them around the handle of a wooden spoon with kitchen twine. The high-low technique slowly cooks the filet before finishing it off with a high temp sear to build that delicious crust. Make the baste. Mix all ingredients in a small pot and bring to a slow simmer, whisking frequently for 5 minutes. Remove from heat and set aside. Make the sauce. Heat a large skillet over medium high heat and melt 3 tablespoons butter. 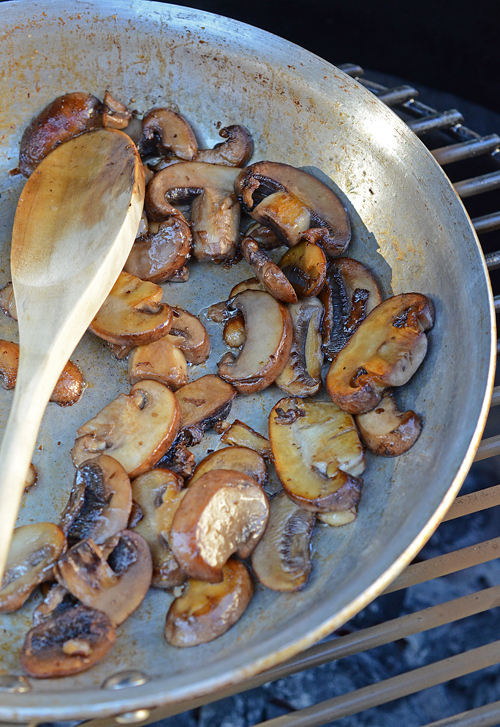 Add sliced mushrooms and saute until softened and browned, 8-10 minutes. Carefully add Marsala wine and deglaze the skillet, scraping any stuck bits with a wooden spoon. When liquid is almost all evaporated, add in the stock and herbs. Simmer until reduced by half and thickened, about 15-20 minutes. Season to taste with salt (1/4 -1/2 teaspoon) and black pepper (about 1/2 teaspoon). Stir in 1 tablespoon of butter and keep warm over very low heat. 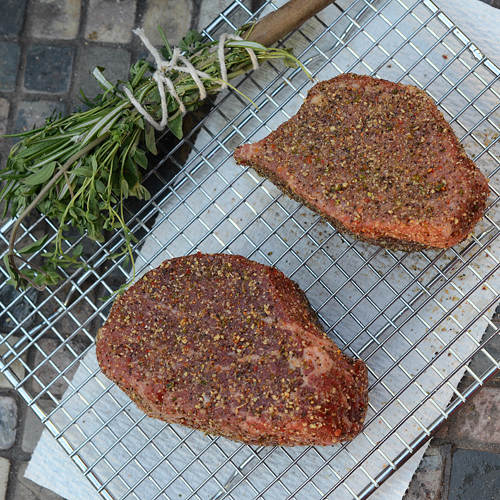 Season steaks with the rub. Then with wet hands, work the rub all around the steaks to form a paste. Let set for 5 minutes. Place the steaks on the raised rack and grill for 2 minutes. Flip and grill another 2 minutes. 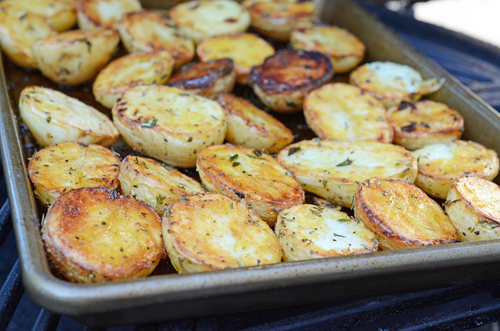 Grill the sides for 1 minute each. Keep the grill lid shut each time. 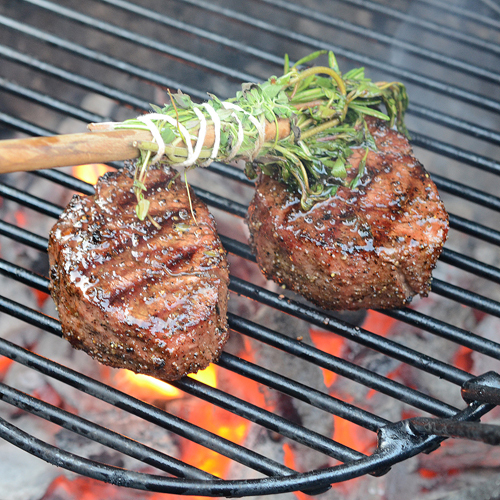 Continue cooking the steaks, turning and basting them with an herb brush every minute, until the steaks reach an internal temperature of 90°F, about another 5 minutes. Remove from heat and let rest at least 5 minutes or up to 30 minutes. Remove the raise grate and return the steaks to the grill. 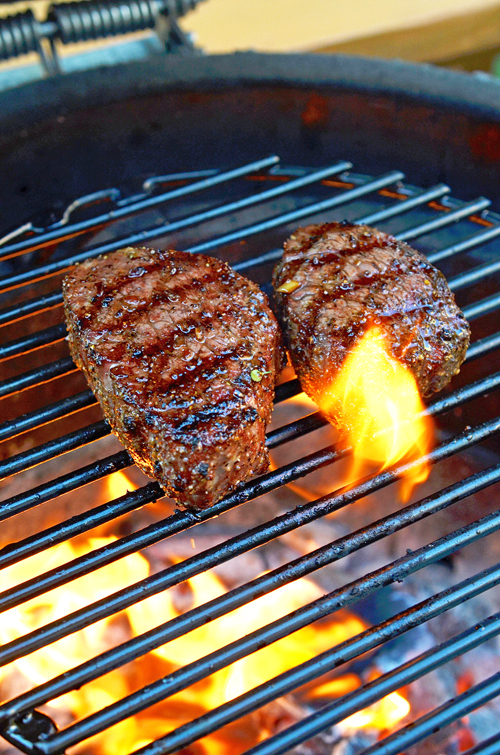 Flip and baste the steaks every minute until they reach an internal temperature of 110-115°F. This will take about 5 more minutes if doing on a regular grate or only 1-2 minutes if using a lowered grate (see notes). Remove steaks and let rest for 5 full minutes. 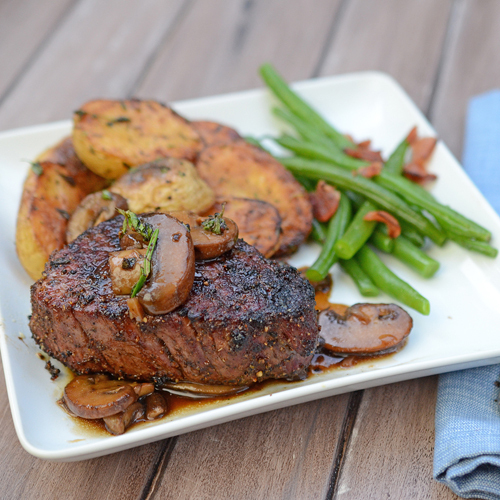 To serve, spoon some of the Marsala Portobello sauce onto the plate, top with a filet, and then spoon a slight amount more of the sauce on top. Baste - This is all about building layers but if you don't feel like making your own, you can buy a jarred baste. The Shed and Stubbs both make a pretty good bottled beef baste. Tallow - I need to do a post on this but tallow is just rendered down beef fat that I keep on hand. You can substitute additional butter or bacon fat. Herb brush - sure you can skip it and use a basting brush but again, it's building layers. 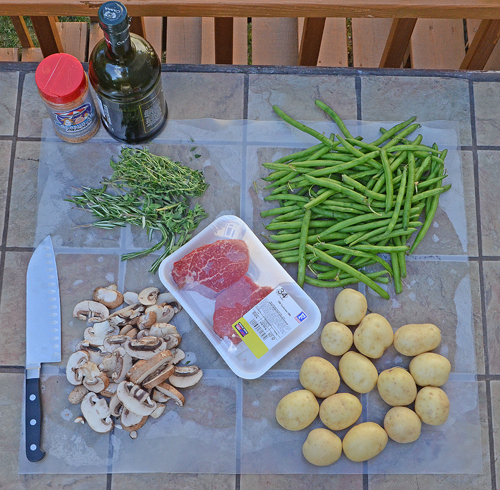 I am loving these disposable cutting boards. We got a roll of them for BBQ comps but they really come in handy for outdoor cooking at home too. Gorgeous afternoon for outdoor cooking. 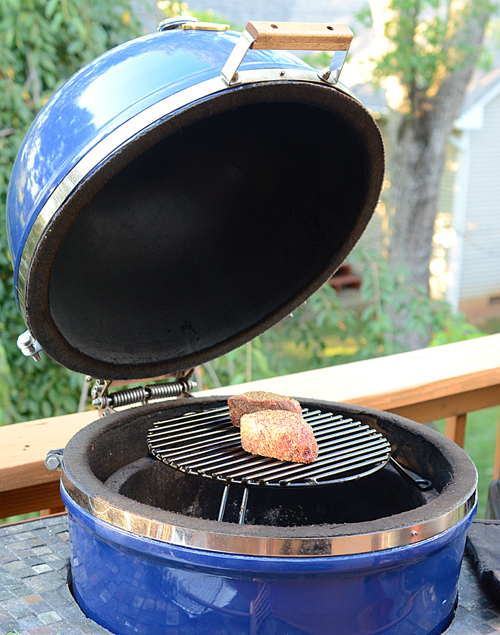 I used the Grill Dome as my main grill and had the Egg fired up to fire roast the potatoes. 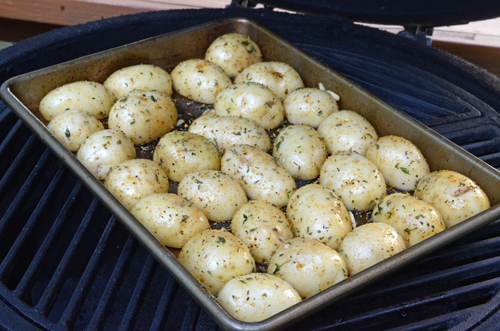 I roasted the potatoes at 400°F for a total of 50 minutes. Rubbed with oil and seasoned with Meat Church Season All, chopped garlic, and a few pinches of chopped herbs. Flipped them after about 30 minutes. 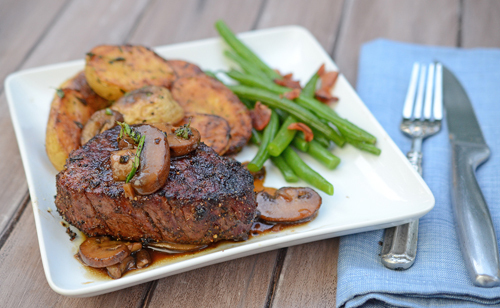 You can do the mushroom sauce on the grill or on stove top. My beef rub is black peppercorns, green peppercorns, dried garlic, dried onions, dried red and green bell pepper coarsely ground up and then oregano and salt added. It's a bit of a pain to make since we dry the peppers ourselves but well worth the flavor for beef. BTW, I love these flip top shaker tops you can buy for plain old mason jars now, perfect for BBQ dudes and dudettes. I think we found ours at the grocery store or Walmart. Rubbing the seasoning in with wet hands to make a paste is one of Adam's techniques. Normally I just lightly oil them before seasoning but this technique worked well too. 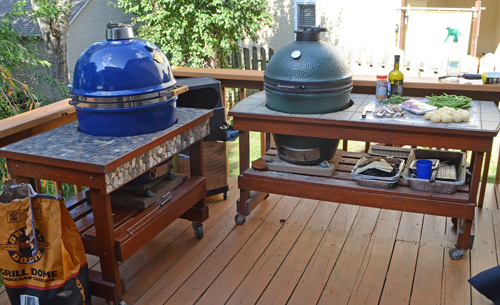 The "raised grate" or "elevated grate" set up for my Grill Dome was the double duty Indirect rack. It served as the raised and lowered rack for this cook, I just flipped it upside down. Here are some other options. For a gas grill you can just use the top rack. There is a lot of turning, flipping, basting, and handling in this recipe - that's a trademark of Adam Perry Lang. He's the opposite of the "only flip a steak once" school of thought. Cooking on the elevated grate like this is effectively cooking at a lower temperature like the start of a reverse sear. Basting with the herb brush just adds layer upon layer of flavor. There's a lot of fat in the baste which will cause flare ups. Don't panic, your elevated grill grate will take care of that for you. Closing the grill lid between each step helps keep flames knocked down too. Flipping the indirect rack grate for the second part of the cook gets the steaks right next to the super hot coals, giving you a power sear in just a minute or two. You could also use a spider rig with a 13" grate. If you are cooking on a normal level grate, this step will take more like 5 minutes. This was a great meal. Even the green beans were something special because that bacon on them was home cured and smoked by my BBQ teammate and neighbor, John. I like this technique and plan to use it this weekend when I try to recreate a pork tenderloin dish that I had at a restaurant recently. I like the layering of flavors and the crust that this builds up. It doesn't replace the reverse sear, this high-low technique is just another awesome tool to have in one's grilling skill set. Have a great weekend and fire up those smokers and grills! [FTC Standard Disclaimer] Grill Dome is our kamado grill sponsor and Certified Angus Beef recently provided me with an educational trip package. I paid full price for the steaks, Meat Church Season All, APL's books, and the mason jar shaker caps. The links for the books and caps are Amazon Affiliate links.